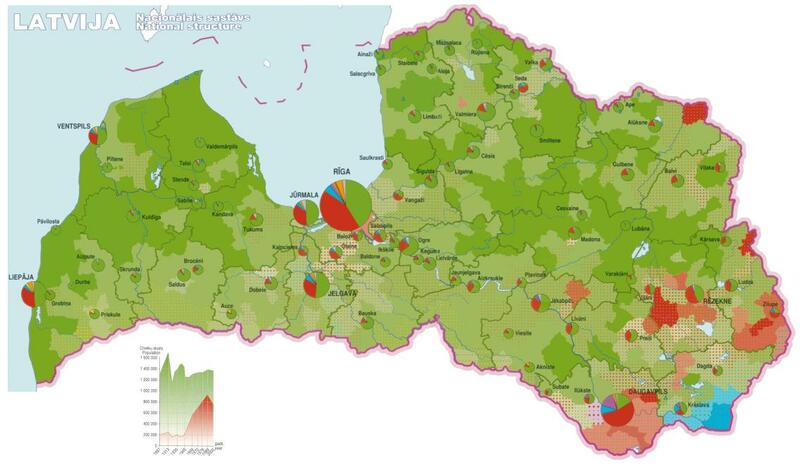 Changes in a number of people of Latvian and Russian ethnic groups in Latvia. Green color indicates Latvians, red color indicates Russians. Other ethnic groups are not shown. Clearly visible is the sharp rise in proportion of Russians after the World War II, as a result of immigration from USSR. 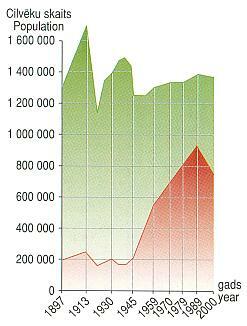 Number of Latvians today has not reached the pre-WWII level, not even mentioning the level before World War I. Please note the inclination of the curve: steep rise in number of Latvians before both World Wars is contrasted by the week, slow increase over the Soviet time. By extrapolating data we can see that, if Latvia would not have regained independence in 1991, some 25 years later (about 2015) Latvians would have become minority in their own country. Ethnic structure of Latvia in year 2000 in accordance to data by Central statistics bureau of Latvia. Solid color indicates majority ethnic group, dots indicate minority ethnic group. The proportion of the ethnic group is indicated, correspondingly, either by density of the color: <50%, 50-70%, 70-90%, >90%, or by size of the dots: 10-30%, 30-46%. Please note, that the cities have unusually high proportion of non-Latvians. During the period when Latvia was incorporated in the USSR the immigrants from other Soviet Union regions were brought over here intentionally, mainly as a workforce for factories for needs of USSR. Some came here on their own, looking for higher living standard. Certain part was military staff and their family members, as well as officials of the Communist party and ideology officers. Also criminals from other parts of USSR, who were brought over to serve their sentence, settled here after being released. Large influx of immigrants with different cultural and ideological background from other parts of USSR during Soviet occupation has lead to creation of a large Russian speaking (but not necessarily Russian) minority which is, because of the historically different world view, as well as because of insufficient knowledge of the Latvian language, relatively alienated from the rest of the population. This often is causing difficulties with the integrity of the society (similar to those which begin to emerge in Western Europe with large groups of immigrants of different cultural origin unwilling to accept the values of the society they have come to). 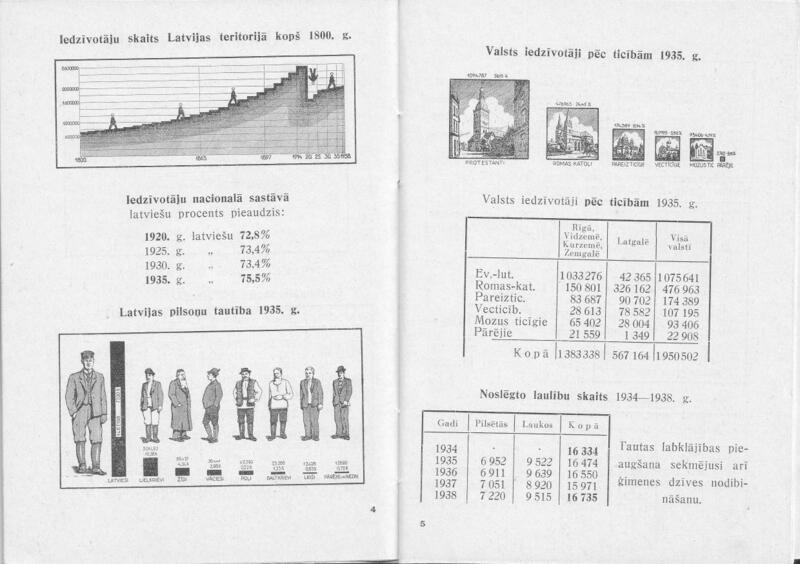 See image Population, ethnic composition, religions, marriages in article Statistical data of Latvia, 1939. Processed scan from “Latvijas kartes” maps, ISBN 9984-07-319-X, published by SIA “Karsu izdevnieciba Jana seta”.